Evidently it has been since February of 2017 that I have posted anything on the blog-digity, which is frankly, SUPER embarrassing, but that is life. 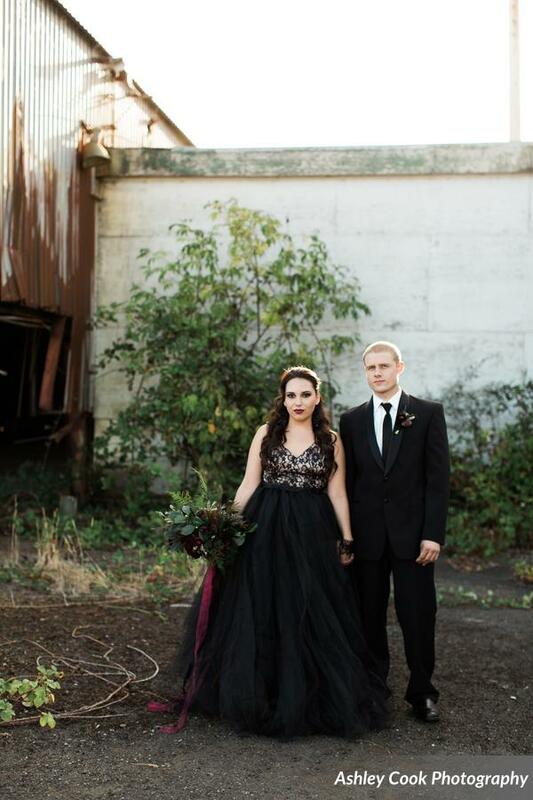 Let's forget that happened and in honor of Throwback Thursday, visit one of my favorite styled shoots TO DATE. 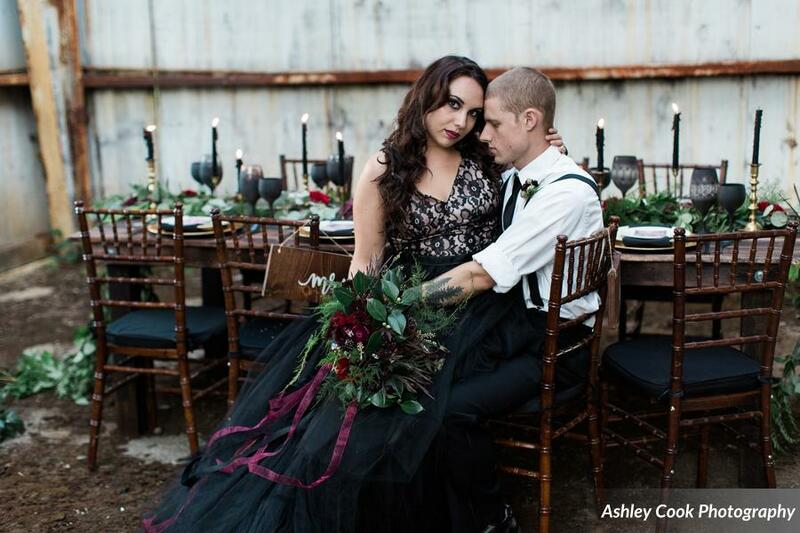 Becky, from Event Crush, asked my to join forces with her, Ashley Cook Photography and a list of other super talented vendors to create a dark/gothic inspired wedding shoot. I will fully admit that at first I was a little worried about this shoot, since this style is not something that I generally create but I am always up for a challenge and was totally willing to give it a try. I really struggled to begin with to come up with something that fit the inspiration for the shoot but also still reflected my style and brand. Finally, after several drafts and trial and error I came up with some designs that I couldn't be happier with. 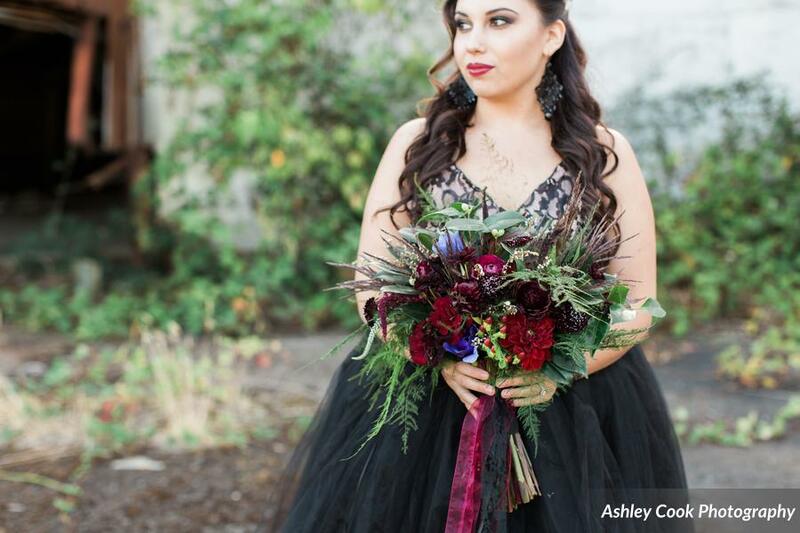 All of the other vendors completely stepped up their game and the shoot turned out stunning. It was also lucky enough to be featured on 100 Layer Cake. Click here to see a full gallery of the shoot as well as a complete list of the vendors who participated. Also, I am putting this in writing, it WILL NOT be almost a YEAR AND A HALF before I post something again. Goodness Katie! There are so many decisions to be made when it comes to your wedding day; the venue...finding your perfect dress...should we have an open bar?...do we really need to invite our crazy third cousins removed...? Eventually all of these decisions can become so overwhelming it is hard to choose what options should be a priority and what ones can be scrapped. Calligraphy is often one of the first things to be removed from the priority list once the reality of your budget sinks in and the realization of how much everything costs and how quickly it is adding up comes into play. While calligraphy is not a necessity for a wedding, there are many reason why hiring a calligrapher can make the wedding process easier and more beautiful for you. Hiring a calligrapher to address your invitations will not only save you time, it can also save you frustration and money. Once you receive your invites in the mail, you can ship them to your calligrapher, along with your address list, and magically they return to you, beautifully addressed! Calligraphers have special tools and know of certain tricks to get your addresses centered and straight. Trying to do this yourself can lead to frustration and also may lead you to having to purchase more envelopes. And do you REALLY want to have to address envelopes when you get home after a long day at work? Most likely not. Calligraphers have an eye for design, color and often times even some form of design degree, so they will be able to help you pick something that will coordinate with your wedding and overall look. Calligraphy doesn't have to just be for your wedding invitations, it can also be used for place cards, menus, programs, wedding vows, signage, ect. Many calligraphers also offer invitation design services. By hiring a calligrapher for all of the design services above, your wedding will have a cohesive design that is carried throughout your whole event. In a time where texting and email reigns king and almost everything is being converted to paperless or digital, receiving a handwritten envelope mail is a rarity. People love seeing their name written, especially when written in beautiful calligraphy. When your guest opens their mailbox to find a gorgeous envelope addressed specially to them, it will not only excite them about your upcoming wedding but also make them feel so special. There is the age old argument that the wedding is about the couple getting married, not about the wedding guests, which is partly true but also partly not. Your wedding guests, if you are inviting the right ones, are the people that have been with you through the highs and lows of your relationship and are now witnessing you and your fiance become one. Once you are married, they will continue to support you throughout your marriage and lives. Your wedding is also the first official party you will be throwing together as a married couple, so why not go the extra mile with your hospitality and make your guests feel extra special? Your guest list includes a priest, an orthopedic surgeon, your childhood best friend and your husband's uncle and aunt who are separated but still living together. Should all of these envelopes be addressed the same? Absolutely not. Your calligrapher will know the proper way to address envelopes based upon different people, professions and circumstances, making sure proper etiquette is followed. Lastly, your wedding is special and will be a day you remember for the rest of your life. You have spent and invested time, energy, money, love and possibly some tears into making sure this day is just how you imagined. If hiring a calligrapher is just not in your budget there are alternatives. You can hand address them yourself, digitally print your envelopes, or even learn faux or real calligraphy yourself. Under no circumstances however, use printed labels. Address labels are used for mass mailings from insurance or televisions companies, not for your wedding. Your wedding invitations are special so why treat them like a discount coupon?